PAGE 24 CLEANING UP THE PAPER TRAIL New technological advancements have begun streamlining the mortgage process, but the human touch remains critical. PAGE 28 SMART LENDING Today's origination process is utilizing tech to better reach unbanked or underbanked demographics. PAGE 32 DRIVING TITLE FORWARD How new tech—and skilled third-party providers—are advancing the title industry. PAGE 35 DATA & ANALYTICS GUIDE Featuring the experts who are helping servicers monitor and analyze their business statistics in some seriously powerful ways. 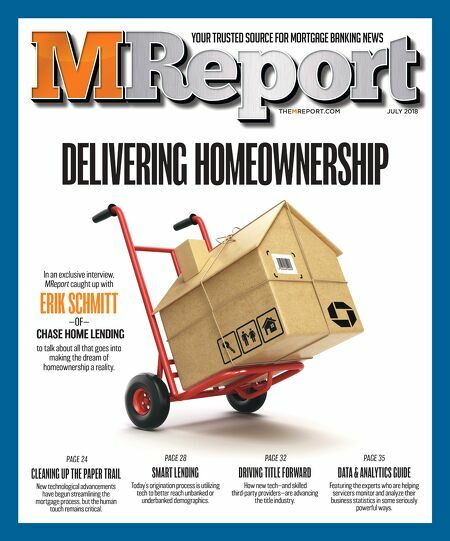 YOUR TRUSTED SOURCE FOR MORTGAGE BANKING NEWS DELIVERING HOMEOWNERSHIP JULY 2018 THEMREPORT.COM In an exclusive interview, MReport caught up with ERIK SCHMITT —OF— CHASE HOME LENDING to talk about all that goes into making the dream of homeownership a reality.